TechnoProzium: Haswell-E: The next big thing? Haswell-E: The next big thing? One of the more interesting news to reach us here at Technoprozium during this last New Year’s Eve is about Intel’s upcoming HEDT (High End Desktop) Haswell-E processors. Haswell-E is supposed to supplant Ivy Bridge-E at the highest end of Intel’s desktop spectrum. According to reports published by various hardware review sites, we are looking at a third quarter 2014 release which would put it somewhere between July and September. In recent times, Intel has been quite immaculate with its "Tick-tock" execution which dictates that the firm replaces an existing core-architecture with a new one within roughly a one year time frame. If you remember that Ivy Bridge-E was introduced around the same time last year, this news is not that much surprising. However, as always the devil lies in detail! 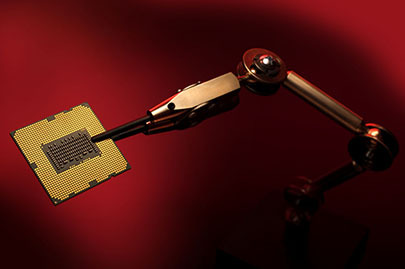 Sources at Techpowerup and Tom's Hardware indicate that Intel will be launching eight-core/sixteen-thread (8C/16T) CPUs as part of Haswell-E for first time in desktops. This is good news because as of now the eight core CPUs (Sandy Bridge-EP/Ivy Bridge-EP) are server only. It stands to reason that the flagship extreme edition (i7-5960X?) will be a full fledged 8C/16T part with a whopping 20 MB L3 cache and a price tag of $1000! It seems Intel is also planning to launch affordable eight core and six core versions to follow-up the flagship at $600 and $400 respectively. Considering the fact that the firm’s cheapest six-core today sells for $579, these are rather attractive price points, not to mention reasonable! Intel will also introduce a brand new X99 chipset which will house these new CPUs. Motherboards based on X99 chipset will feature native USB support and up - to10 SATA 3 (6 GB/s) ports. This is another welcome move from the company as the existing X79 chipset has already started to show its age! Although the new motherboards will retain the LGA-2011 socket, a different pin layout will be used to incorporate the new Haswell-E based processors. Now let’s analyze things from a broader perspective. Haswell is a new micro-architecture and as such a “Tock” in Intel’s development cadence. From the reviews we’ve seen that Haswell based CPUs are faster in pure x86 workloads than their Ivy Bridge counterparts, albeit not by a significant margin. Haswell graphics on the other hand is a mighty force as far as IGP performance is concerned. This is a reflection of Intel’s design philosophy of late which prioritizes graphics performance and power optimization over raw processing capacity. While this strategy works well within mobile devices, it’s not as favored among desktop enthusiasts and power users who don’t have much use of integrated graphics. Things become even tighter as we move upward in the spectrum! With the lack of an on-die GPU, everything here comes down to two vectors – the number of physical cores and per core (single threaded) performance. Core count has not changed at all since Gulftown, Intel’s first six-core desktop. Single threaded performance on the other hand depends heavily on IPC and clock speed - both of which have not seen any significant improvement since Sandy Bridge (clock speed actually went downward when Intel moved to 22nm 3d-FinFET fabrication process!). 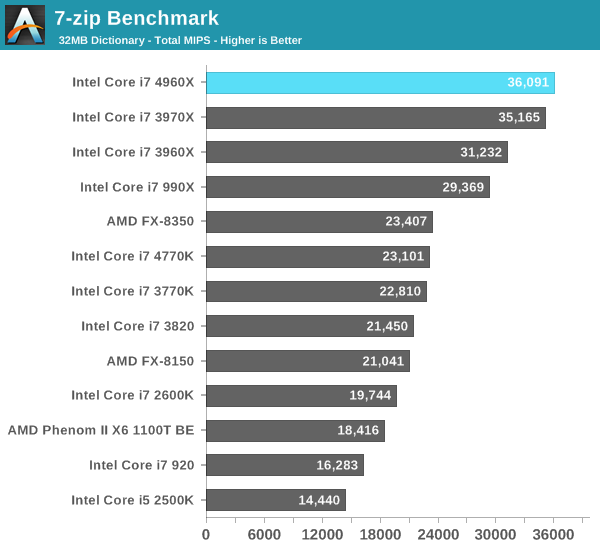 Have a look on this benchmark slide taken from Anandtech and you'll get a better idea of what we're talking here. There are many situation where having more than 4 processing cores is helpful; rendering, compiling, video trance-coding, compression/decompression are few among such workloads. This 7-zip benchmark however not only demonstrates the effectiveness of multi-core CPUs but also vindicates the fact that performance difference between three generation of Intel's 6-core processors has been less than stellar! This is one reasons why an i7-4960X is a tough sell to those who already have a 3960X or even an older and overclocked i7-990X! There is however one more complexity to this whole equation and it's "Broadwell" - Intel’s very own 14nm “Tick”! Last year, Haswell arrived before IVB-E and due to architectural advancements made the later look somewhat less appealing for mainstream users and enthusiasts. The question is can Broadwell do the same to Haswell-E? It's not an easy question to answer since we don’t have much information regarding this upcoming refresh except that it will replace Haswell at some point down the road and likely to have a lower TDP. However, we feel it's safe to assume that since it'll be a "Tick" - which means the the underlying architecture will remain unchanged, IPC gains over Haswell would be minimal. Endowed with more cores and a newer platform, Haswell-E should be able hold its own. Still, it's kind of awkward not to have the best available technology in your flagship parts! Finally, let's not forget that at this point these are but rational speculations. As more information and road-maps (and hopefully some benchmarks) become available, we'll be able to draw a better picture. 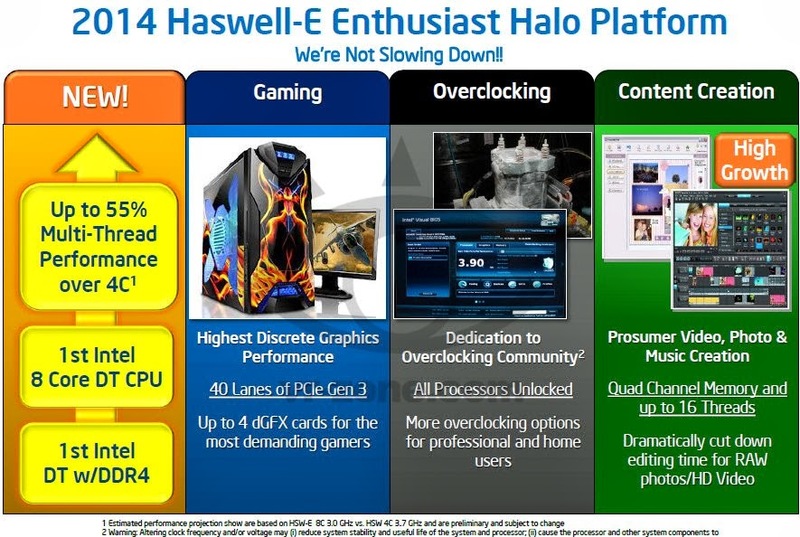 For now and at least on paper Haswell-E looks mighty interesting!